I couldn’t take the pictures of all the dishes I made for Onam, yet managed to take some pictures of the recipes. Kichadi/Pachadi prepared from vegetables such as pine apple, cucumber (vellarikka), ladies finger (vendakka) , bitter gourd (pavayka) or similar, using yoghurt mixed with ground coconut, mustard etc. as masala. Cooked dish will be seasoned with mustard seeds spluttered in coconut oil. Taste of kichadi / pachadi is related to the vegetable ingredient- like the pine apple will be sweet and bitter gourd will be sour etc. I am still not sure of what are Pachadi and Kichadi. I think for Pachadi we grind mustard along with coconut and for Kichadi we just season with mustard with the other ingredients. I made Vellarikka Pachadi for Onam. Vellarikka is kept for Kerala New year (Vishu Kani) and pachadi is made for Sadhya (feast). I don’t see this veggie often at stores, but this time it was available during Onam. So here goes the recipe!! Peel the skin of Cucumber and finely chop them. ½ cup - 1 cup curd or yogurt. Heat pan with little oil, and add the cucumber with 2-3 tsp of water and salt and cover cook for few minutes until the cucumber gets cooked. Add the ground paste to it and cook in medium heat. You can add little water if you need --the mixture should be thick. Mean while- heat oil in another pan, splutter mustard seeds, 2-3 red chilies, and curry leaves. Add the above seasoning to the cucumber mixture and switch off the heat. 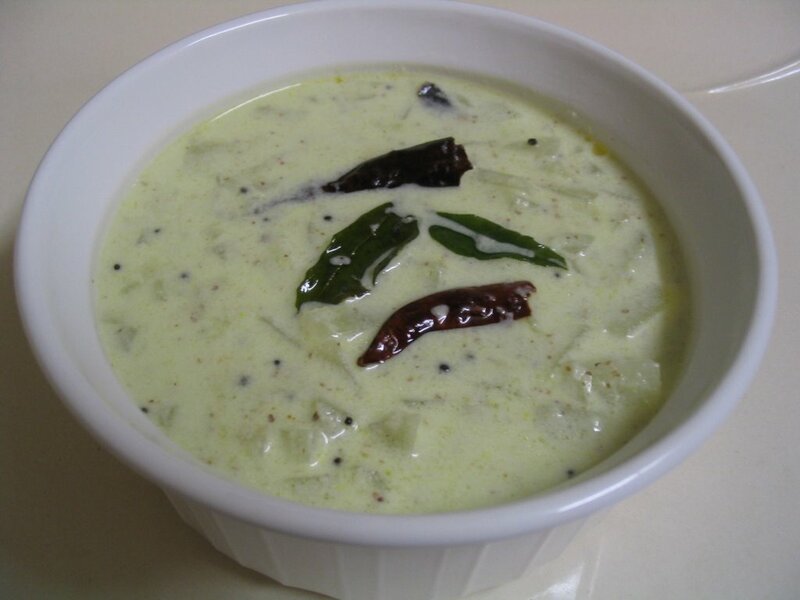 Allow the mixture to cool and add ½ to 1 cup of beaten curd or yogurt to the mixture. Have with rice or as a side dish. See fellow bloggers pachadi’s: Beetroot Pachadi, Cucumber Kichadi / Pachadi, Pineapple Pachadi, Mango pachadi, and Green Banana Pachadi. Oh! Perfect timing !! I just made sambhar and was cutting a cucumber for a side dish to chill !! Thanks Darlin'!! Priya,Thanks for tagging me and for sharing the recipe. Meme - ABOUT ME, ME AND ONLY ME!